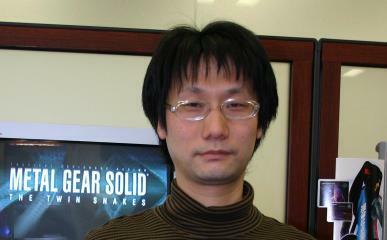 Kojima Hideo has been the director of some of the most impressive games ever. He has achieved this by making the games realistic through the inclusion of detail, deep character development, humor, voice acting and above all, excellent story lines and game play with fresh ideas. These stories are not just great plot-wise, but sometimes have deep philosophic questions underneath them: "What is a human being? What is the basis of conflict?" As stated in GameCritics.com: "In embedding a relevant message in a video game, Kojima proves that it is possible to use video games as vehicles for expressing an artistic vision. That so few games do so is an absolute crime and an insult to the intelligence of the gaming public." This gallery (and all of Junker HQ) was created for the collector, because when I began collecting Hideo Kojima's games I had the curiosity to know how other versions looked like, and if I was missing something big that was worth buying. I hope this might help you figure out what merchandise is worth buying for you. In the first section you will find detailed scans of the games, manuals, spine cards, etc; that came with them. There are also other sections with trading card sets of Snatcher and Policenauts, Soundtracks, books, magazines and promotional stuff I have gathered, hope you like them. If you are interested in specific information visit the Kojima Game Forums, someone may know the answer you seek. If you want a complete list of Kojima games, it is available here, and in case you need a biography on Hideo Kojima, visit Wikipedia. Also available on this site, is a page with Text dumps of Kojima games. I was fortunate enough to meet Kojima personally, and visit Japan during March 2004. You can view pictures of that visit in the Japan trip page here at Junker HQ. Games that have are the ones in which Kojima was directly involved as director and games marked with are those created by the Kojima Productions team. Games marked as PORT are the ones that were translated as faithfully as possible to another console without Kojima's involvement other than supervisor/producer. EXTRAS denoted those games that include the original version of a Kojima game and simply are an expansion of the work, such extras may not be Kojima's direct work. Finally, games marked as REMAKE are the ones created by a different team based on the original work. The rest of the games just indicate the role in which Kojima participated. Games marked with Names in Blue Color have scans thanks to the contribution of individuals, the appropriate credits are given on each item's page. I am willing to get some of the Snatcher, Metal Gear and Kojima related stuff I do not have and am open to offers. Click the link on the game's name to see a gallery of images Box, CD, specific art, Spine card (Obi), etc. I only have those materials with links, the other are presented for completeness sake. Please don't make direct links to the images, but to this page or game page instead. Thanks. This was the first Kojima game I ever played. Heavily plot oriented, in a style sometimes called digital manga, you play the part of Gillian Seed, a JUNKER. Attention to detail and character relationships are great, as well as the story line and music. It is an excellent cyber punk adventure featuring elements from Terminator and Blade Runner. Special thanks go to Jeremy Blaustein and Scott T. Hards for the excellent translation work they made with the Sega CD version, the first version to be in English. An MSX English version that is available now, check out this page. Please visit the Snatcher Gallery Page for more information and a group picture image map. This series has excelled since the beginning and is Kojima's best know work worldwide. It focuses mainly on stealth, great game play action and storytelling. On this series, Kojima has expressed several deep themes, specially on the Solid versions (I wrote an analysis on the themes explored in MGS2). Techniques that blend video games with movies are widely used, and sometimes are attacked as "too cinematic". I think that the series mostly represents the actual limits of this blend, and a very novel form of story telling that actually involves the player in a way that no other media can, as a result from the natural interactive position the player is placed on, the true actual limits of Digital Interactive Art. Zone of the Enders is an excellent mecha title. Kojima was just the producer but you can certainly notice his influence and references, also the mecha design is by Yoji Shinkawa. The action, music, detail and graphics are the best of its kind, thanks to Directors Norikai Okamura and Shuyo Murata. But the main feature of this game is its control, simply the best. I must add that the sequel, Anubis, was improved in every single way possible. It adds a lot in terms of graphics, speed, playability, music and story. Some of the most epic battles on a game will be found here, alongside the best mecha game I have ever played. An innovative concept in portable games, that takes advantage of the said portability by incorporating a solar cell that maps the amount of natural light available to the player to the quantity available in game. You play the role of a Vampire Hunter that uses a Sun Gun and other weapons. I can tell that it is fun to play, and that it makes you get out to the sun for a while. very interesting concepts in work here. After playing the US release, I am quite happy with the final game since it applies the idea of using sunlight in a lot of creative ways, not always to your advantage and in some very unexpected manners. Highly recommended if you are looking for a fresh game that makes you go outdoors. This sequel to Antarctic Adventure was the first game Kojima worked on, as an assistant director. It has been acclaimed as one of the best MSX action games for its gameplay, depth, variety and rich 3D sprite based graphics that created a solid experience. The story follows Pentarou, a penguin who has to bring home a golden apple in order to cure Penko Hime (the Penguin Princess). I must say that it truly is a joy to play, if you want more info on the game, check out this excellent site: Penguin Adventure's Help and Trivia, it even has info on how to get the all so elusive happy ending... very unique way to get it. These games belong to the "dating sim" genre. You play the part of a guy and you meet girls that you have to date and talk to. I actually cannot provide too much info on them, since I barely placed them in my Playstation. I must thank Takamichi, James and Akihabara (280 yen is not a bad price) for helping me get them. Tabidachi was included for completeness's sake, since it was only Produced by Kojima. One interesting detail though, is that these three do use the Policenauts engine. Snatcher PC Engine Magazine Volume 1 Some unique stuff there! 牌の魔術師 (Hai no Majutsushi) A Mahjong game that includes a Snatcher as a playable character, amongst other Konami stars including Pentarou, Goemon, Simon Belmont and a Moai. ウインビーのネオシネマ倶楽部２ パラダイス編, アレンジ 1994 • Contains a version of "Theme Of Katharine (Part 2)"
Track 8 "Summer-Colored Dream (Snatcher)"
ウインビーのネオシネマ倶楽部３～ときめき編, アレンジ 1995 • Contains a version of "Theme Of Ending"
Track 5 "Forever Blue (Snatcher)"
AICT 1227-1228 beatmania Club MIX Original Soundtrack 2000 • Includes a track called "SNATCHER [Dual vacuum Mix]" that has some sax tunes from "One Night in Neo Kobe City"
Snake's Revenge • The sequel made by ULTRA Games (A Konami US subsidiary at the time) that pushed the series forward by driving Kojima to create Metal Gear 2: Solid Snake. It is not a Kojima or Metal Gear game in the strict sense, but its importance is essential. The Snake art shines on this one. ドリームミックスＴＶ　ワールドファイターズ • A strange mix between Konami, Hudson and Takara, in which Solid Snake is a playable character. Metal Gear Solid 2: SOL Making of DVD Given as a bonus to preorders of the SOL game. Metal Gear Solid 2: Substance Bonus Ration Given as a preorder bonus at Konamistyle. E3 2003 Konami Press Kit: MGS3: Snake Eater Promotional Folder Includes a paper model labeled as "Classified Mech for MGS 3". Sent via mail to American press before the E3. There are even pictures of an open can, by a guy that *did* open it. Metal Gear Solid 3 Promotional DVD 2 Given only to stores, has the TGS 2004 trailer, and the intro for the game. Tokyo Game Show 2004 Konami Press Kit It contains an EP analogue to the LP in the E3 Press kit, which has a funny MGS3 Manga. Signed Brought to me by Akira (thanks a lot man!). It contains the mission, game history and future games of the team. The games previewed are: Metal Gear Ac!d 2 (PSP), Metal Gear Solid 3: Subsistence (PS2) and Metal Gear Solid 4 (PS3). Real Action Heroes No. 226 Metal Gear Solid 3: Snake Eater Naked Snake, Squares Camouflage Ver. Real Action Heroes No. 228 Metal Gear Solid 3: Snake Eater Naked Snake, Snake Camouflage Ver. E3 2003 Konami Press Kit: MGS Twin Snakes Promotional Tri-fold. An old picture of some Kojima Games, and another with MGS figures. Also a group picture of Kojima games. Thanks to Dohga Rodorio for the info on the Tokimemo Games.